Just cause they are called “meatballs” doesn’t mean I can’t make vegan ones right? 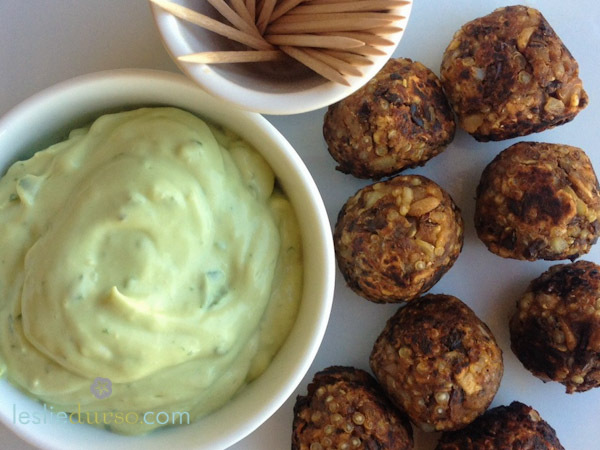 These cocktail balls are perfect for your next soiree served with my avocado aioli or my chili-grape sauce. Or if you want to be super traditional, you can serve these with marinara and a big pile of spaghetti! Leslie’s Meat(Less)Balls 1 15 oz. can of black beans, drained and rinsed 1 15 oz. can of white beans, drained and rinsed 1 onion, minced 5 cloves of garlic, minced 8 oz. mushrooms, finely chopped 1/2 cup oats 1/2 cup cooked brown rice 1/4 cup breadcrumbs 2 tbsp. nutritional yeast (optional) 1 heaping tbsp. chili powder 2 tsp. paprika 1 tsp. cumin 1/2 tsp. salt 1-2 tbsp. red wine With a potato masher or your hands, smash the beans in a large bowl until most of the beans are smashed. Add in all of the other ingredients. Mix well! Roll your meatballs into 1-1 1/2 inch size balls. Now you can either bake on a greased cookie sheet at 375 degrees for about 15 minutes flipping halfway through OR You can cook these in a frying pan sprayed with just a little bit of cooking oil on medium high heat until browned all around. Enjoy!! ps you can roll these balls and refrigerate overnight or even freeze! I don’t see a print option and wanted to print this out to add to my recipe collection. A change I thought, instead of using cooked rice, would be to use brown rice flour, probably 1/3 to 1/2 cup. I bet that would work well.